This morning, I took on the tough challenge of stalking the Instagram accounts of various Victoria's Secret Models. Leading up to the runway show, these beauties undergo a regimented diet and beauty routine to ensure they are flawless for the televised event. My job to was uncover the hidden mysteries of how they stay ready. One of the beauties that I happened upon today was Lameka Fox. I scrolled through her feed desperate for glimpses of her favorite beauty treatments. One of her posts, in particular, stopped me dead in my tracks. Unfortunately, she left out the caption so I was left wondering about her metallic face mask. "What's the name of the brand and was is it intended to do?" So many unanswered questions. 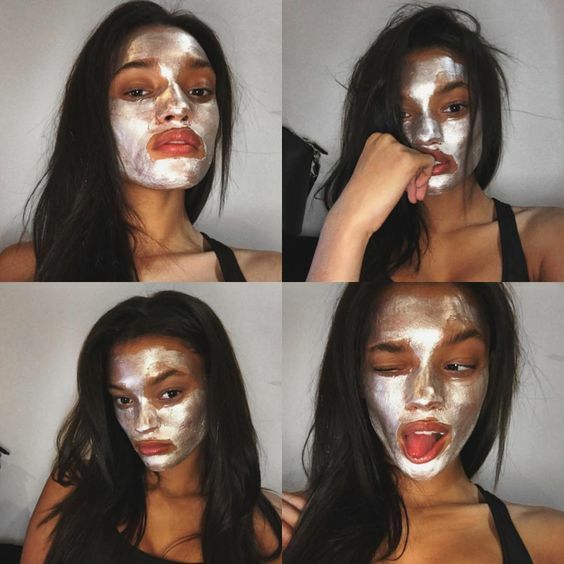 After searching Google, I discovered that her metallic mask might be GlamGlow's GRAVITY MUD. Glam Glow is the master of masks. They basically have a mask for every single skin concern. This one in particular is a firming treatment. Here are the merits of this facial mask according to GlamGlow's website. Essentially, this is a mask that helps to promote firm, toned skin. Sounds a little too good to be true. But, I'm a huge fan of GlamGlow products so I sought out reviews with an open mind. Even though it's a firming mask, most everyone who enjoyed the product claimed to experience softer skin. I think this has a lot to do with the nature of the mask. It's my belief the peel off masks (vs the ones that wash off) have the ability to lightly exfoliate. As you peel the product away, you're probably removing some dead skin along with it. This should have immediate softening effects along with long term brightening. Licorice root is one of the ingredients in GlamGlow and, if you weren't aware, licorice is an all natural treatment for hyperpigmentation. So over time, this mask could help even out skin tone with regular use. But let's talk about the firming effects. The reviews on this are mixed. Some say they didn't notice any instant firming but most of them were Youtubers in their 20's who had no need for skin lifting. One reviewer, who claimed this as one of her holy grail products, boasted that GRAVITYMUD makes her skin smooth, tight, and firm. My theory is the firming comes mainly in the form of pore tightening. Peel off masks have the ability to lift out gunk trapped in the pores. That's a recipe for ultra smooth, firm skin. One woman in particular said that this firming mask made an immediate impact to her deep neck wrinkles after one use. Years ago, my brother went on a skin car journey of sorts. It began after he suffered an injury to the face while playing basketball. To prevent long-term scarring, he faithfully popped a vitamin E capsule and rubbed the oil on his scar every night. After noticing the difference in his skin, he went all out and developed a detailed skin regimen. I don't remember all the steps, but I do remember him applying a peel off mask religiously. Weeks into his regimen, that man had the skin of an angel. I've never really incorporated a peel off mask into my rotation and I realize now that I'm making a mistake. My skin is easily congested. A peel of mask can seriously help with declogging pores. Might as well grab a peel of mask that promises to, not only soften my skin, but to firm it as well. The plan is to add this mask into rotation as a pre-night out product. Oh, best of all, Amazon has it available for way less than other retailers.